It is a wonderful time of the year! The birds are singing, the lambs are jumping, the days are longer, the sun is shining (a little bit more), the bees are buzzing… the pollen is flying! So many welcome the start of spring and summer with open arms. However, if you are one of those who suffers from hay fever (1 in 5 suffer in UK), you know it is the start of an assault on your senses! Hey fever is a pollen allergy. It is usually one of, or a combination of tree pollen, grass pollen and weed pollen. 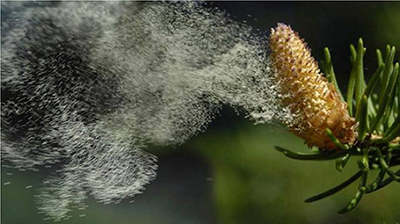 In most cases of hay fever, it is this tiny, light weight, pollen which is blown in the wind from plant to plant that inevitably catches you. When is the pollen season? The good news, or bad news is that pollen from the main three pollen types blooms at certain times of the year. You may suffer from one type of pollen or be unlucky and suffer with them all. Unfortunately, there is no cure for hey fever and you can’t prevent it completely. However, you can ease the symptoms. Speak to a health professional for more information and treatments, such as antihistamine drops, tablets and nasal sprays. Find a pharmacist. Pick up any information from a Dyfi Valley Health surgery and make sure you book an appointment if your symptoms are getting worse or your symptoms don’t improve after taking medicines from the pharmacy.